Hello all. I intend to continue my series on the Volga region costumes, i have yet to cover the Moksh-Erzya, [Mordvin], and the Chuvash, i am waiting for the arrival of a couple of books that will provide more information on this topic. 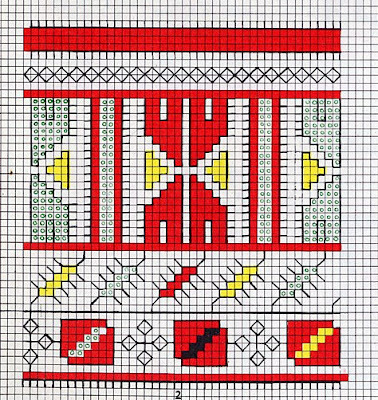 Today i want to talk about two particular embroidery designs that have come from outside Ukraine but have become very important in Ukrainian Culture. This is the first one. This piece was embroidered by my late grandmother, Maria Kozak. Believe it or not, this image is a bit larger than life-sized. The original piece has about 20 cross-stitches to the inch. Originally it was made for a shirt that she embroidered for my father, some time in the 1930's. After he outgrew it, she took the embroidered pieces and made them into a cover for a sofa pillow. This is very typical. 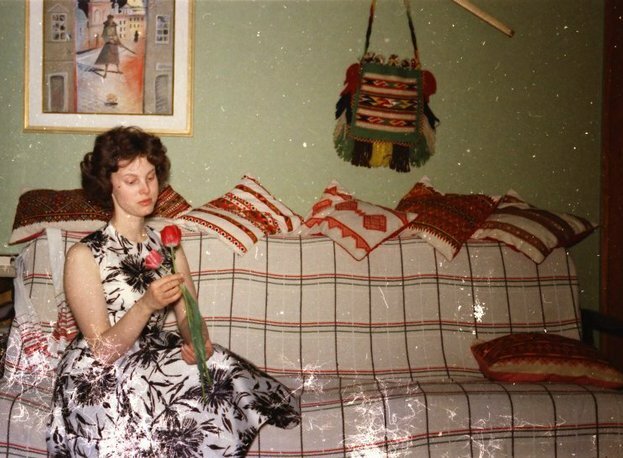 In any Ukrainian home where someone embroiders, you will find several decorative pillows lined up on top of the back of the sofa. The image on the left is a photograph of my grandmother taken in 1935, about the time that she embroidered this piece. She is the one on the right. 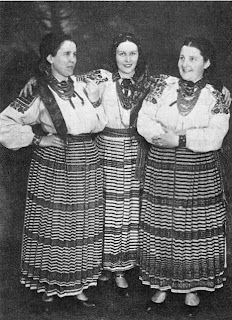 This photograph was taken in the city of Lviw, during an event that was called a "Folk Costume Fashion Show". Many photographs exist of this event. I admit to wishing fervently that i could go back and visit it with a high-resolution color digital camera. The image on the left shows my grandparent's flat in the 1950's. The admittedly cheap couch is covered with a cloth woven in crosswise stripes and many embroidered pillows. I always remember her house and that of all of her friends being full of embroidery in this manner. That is my mother sitting on the couch. This image was remastered from an old slide, which explains the scratches. On the wall is one of my grandfather's paintings and a woven shoulder bag from Ukraine. I half-remember a story my grandmother told me that Het'man Polubotok obtained a shirt embroidered with this design, whether as loot or ransom or a gift I have read in other sources that he married a foreign woman who wore this design on her chemise. In any case, according to my grandmother, the design was copied far and wide by embroiderers because of its connection to this important person, and because it was different from what they were used to. 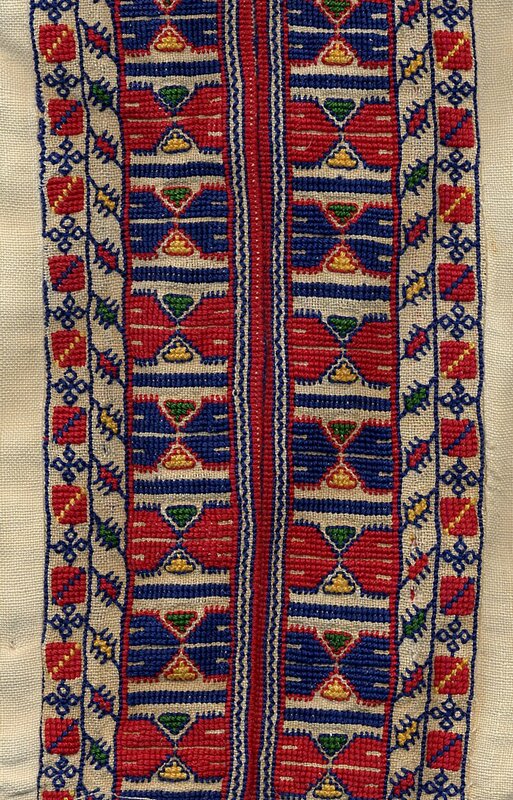 The design is more reminiscent of the embroidery of the Volga region or of the Balkans, [which have a historical connection through the Bolgar tribe] than of Ukrainian embroidery.But because Het'man Polubotok stood up to the Romanov Tsar, fighting for the rights of Ukraine, this design has become almost a symbol of Ukrainian Identity. In more recent years the design has often been embroidered in sky blue and gold, which are the Ukrainian National Colors. It is also widely embroidered because its various components lend themselves to being rearranged, so being able to form many compositions. Here is one example. This piece was embroidered by Nina Ipatiy. 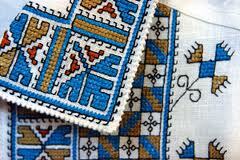 She is a very accomplished Ukrainian embroiderer who makes her work available online. She is very skilled, and her website is worth a visit. Here is yet another example in another color scheme. (c) 2006 D. Dmytrykiw Ukrainian Ethnographic Collection, Archives, & Library of Avon Lake, Ohio; used by permission. 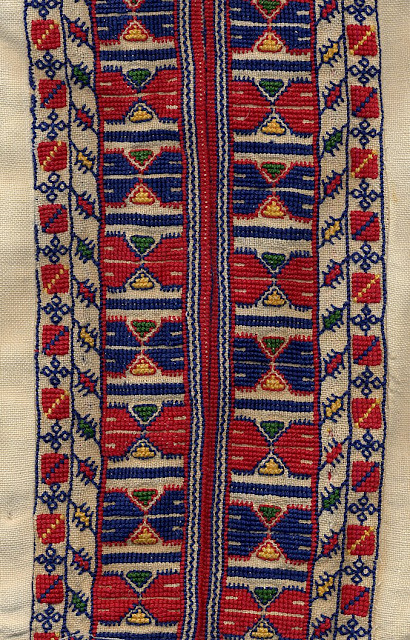 This item is part of Danylo Dmytrykiw's collection of Ukrainian Costumes and Embroidery. You can see this and other items from his collection at the Website of the Ukrainian Museum of Cleveland. The polubotok image is on the bottom right. You can click on it to see a larger image. The second design i wish to talk about it this one. 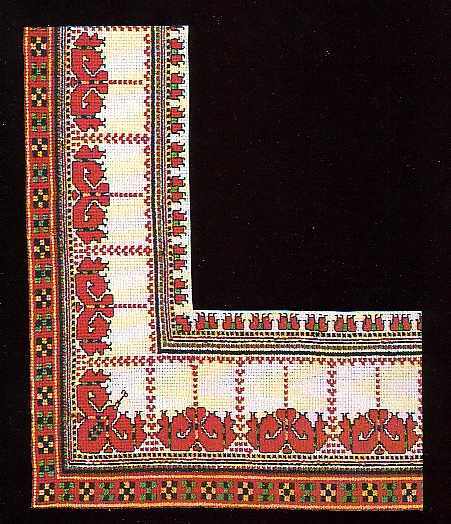 I noticed this design appearing in Ukrainian households all over the place a couple decades ago. I was very mystified, as it does not resemble traditional Ukrainian designs at all. I found out that this image had been published in the book. Political Prisoners In The U.S.S.R."
This book published poetry and photographs of embroidery created by women who were being held in Soviet camps for political prisoners. These women were standing up to the Soviet government, asking for basic human rights, and for their speech, writings, and participation in demonstrations were locked up for years in concentration camps. These embroideries were made by these women while in camps in the Mordovian Autonomous Republic. For a fuller explanation of this book, and its contents see this website. and how they can have very strong significance to a nation and to individuals. As always, thank you for reading. I welcome your input, and corrections. I'm about to start a project to recreate a German men's folk shirt. 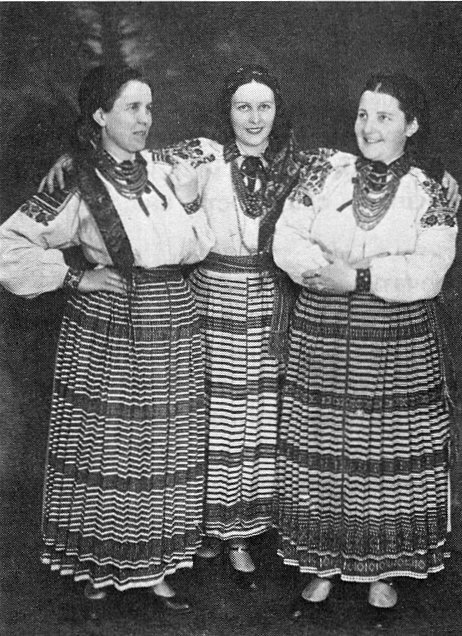 In researching this, it came as a surprise to me that the Germans used to embroider their shirts, and in many ways the cut and decoration of their shirts are very similar to Ukrainian, though the embroidery was almost always whitework. I wonder if you might have some further information. The reference I have is specific to Mittelfranken, but I suspect the construction and decoration of the shirt was widespread in Germany. Hello, Roman -- Sorry, the blog-page will not let me use so-called "illigal_characters", but will not tell me what those are ! what are those? Here goes my third try-- using no contractions which use an apostrophe. Roman -- It is great that you included information about the GULAG imprisonment of Ukrainian women who were arrested, sentenced and deported out of their Ukrainain homeland to the camps of "strict regime" in other counties and severe climates within the Russian-controlled _Soviet_Union_ is wonderful. This is excellent supplementary info for the general public, who may not be aware of such punishment on women, especially Ukrainian women who knew that they would be denied their basic human rights, yet who simply wanted to be allowed to write using their native language in their own country, and to practice their native traditions, and not be punished for doing that. notice that most, if not all, of the embroidered items shown there are of individual compositions and some _applied art_, meaning that all of them are really not _traditional_ Ukrainian embroidery at all, but are the personal expressions of the Ukrainian women in the Gulag camp, based in some aspect of Ukrainian history or embroidery traditions. Not to me - not clear at all. In actual point of fact, what you say is "from the same basic tradition" has not been clearly shown here. Please - could you be more specific ? Could you show what you see as same or from same tradition in those embroideries compared to the Gulag one you showed? I just discovered this blog and love it. I did some independent study in Croatian Embroidery and costuming in college, and ended up having a Fulbright to Croatia in 1989. European ethnic textiles are a love of mine and I have not seen such a wonderful collection in one place before. You post nothing about your background or contact info. I do costuming for a Croatian dance troupe and do fiber arts design drawing from historical textiles. I am glad that you enjoy the blog. I would love to learn from you. I do in fact put contact information in my more recent articles. I am ashamed to admit that it took me a while to get the idea to do so. My personal background is mostly Ukrainian and Scottish. I do folk dance, and i also do research for performing groups, and also sew and embroider folk costumes on commission. Hello Roman! Sorry for the mistakes, I know English badly ..
Perhaps you have information or can conduct a study on embroidery in the Zhytomyr region. Berdichevsky and Romanovsky reyons. Were there any features in the embroidery? What techniques prevailed? What components of the costume were popular?